Does your blood pressure soar to new heights when your favorite team bombs? Is the urge to throw something at the tv too powerful to ignore? You need The TV Brick™! It’s the lightweight, durable foam brick that’s perfect for throwing at the tv on game day! The TV Brick™ is a unique sports souvenir for every type of sports enthusiast! Just imagine: The big game is down to the wire. Any play can determine the next hero or goat. As the clock ticks down your team chokes as you watch certain victory slip through their fingertips. You’re ready to boil over and looking for something to throw. The remote? No. The lamp on the side table? No. The family's beloved dog Mickey? Heck no! You don't want to cause injuries, you just want to let off some steam. Your best option for sports stress relief? 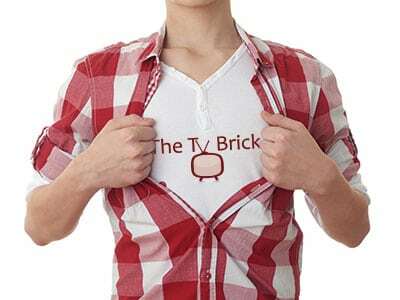 The TV Brick™! Get your own TV Brick! Is This You On Game Day? We all know that feeling you get when the refs make that bogus call against your favorite team. It’s the same kind of feeling you get when a player drops the game-winning pass or misses the clenching shot. You need something to throw at the TV and you need it NOW!